This week, we thought that we would post on the Ridington Room, a room in the Barber Centre that is not named after a place in British Columbia. Rather, the Ridington Room (room 321) is named after an important person in the history of the University of British Columbia Library: John Ridington. 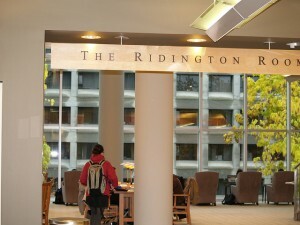 John Ridington was UBC’s first University Librarian. A former journalist and teacher, he started work on the library collection in August 1914 when UBC was in its temporary home at West 10th Avenue and Laurel Street (the Fairview Shacks). By 1916, he had been appointed University Librarian, a position he remained in until his retirement at the age of 72 in April 1940. According to information gathered by the UBC Archives, Ridington was known as a rigid authoritarian and was nicknamed ‘King John’. 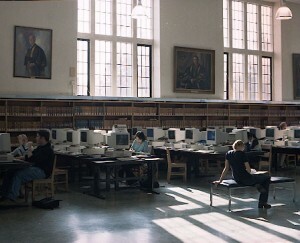 The University Archives is responsible for collecting material related to the University and, therefore, holds the papers of John Ridington and his family. If you are interested in learning more about the life of UBC’s first University librarian, take a look at the finding aid (“an aid for finding items in an archival collection”) to the collection that is available on the University Archives website. The Ridington Room is definitely worth a visit if you haven’t already had the oppportunity to see the space. 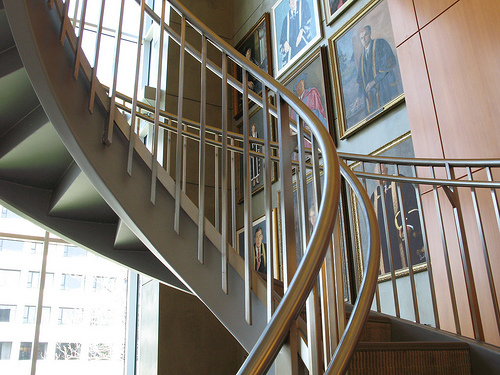 It is often called the “Harry Potter Room” by students, due to the winding staircase and the portrait-covered walls. A portrait of John Ridington, painted in 1912 by his brother-in-law Malcolm Charleston, hangs in the Ridington Room. 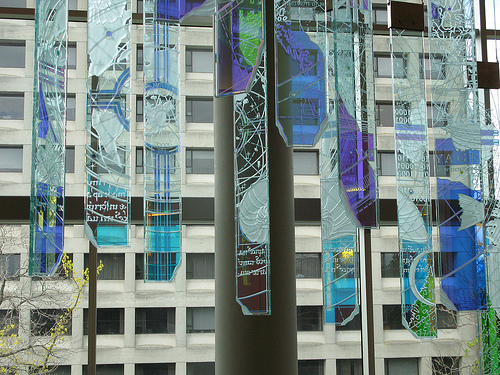 There is also a magnificent art installation by Vancouver artist John Nutter, who was commissioned by Jean Barber to to design a 45-panel glass sculpture that is intended to “flow like the Northern Lights,” and features intricate etchings designed around a series of compasses. 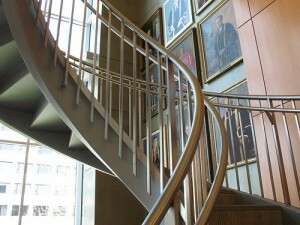 Nutter felt the Library, like a compass, should be used “as a tool of discovery.” It is an ideal space for quiet study, but be sure to arrive early because the comfortable chairs fill up quickly!